Slingbox is a small hardware device that encodes an A/V input signal and serves it over the Internet. In this way you can have your favorite show with you wherever you go, without having to maintain a server PC at your home. At first site the lack of an internal TV tuner may seem like a bad point, but this is actually the main design idea of this device: in allows controlling your existing A/V equipment. You may look at Slingbox as a remote connection to your A/V equipment. 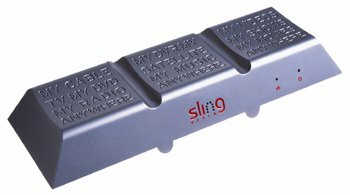 Instead of creating a complex and expensive device that may possible include TV tunner, PVR, etc., Sling Media created a simple yet effective device. Most people have already PVRs at home, so buying a second PVR doesn’t make sense from at least two reasons: first price and second you lose to ability to have all the recorded shows in one place. To better understand the product just watch yourself this video, where a guy is checking his TiVO system, back home in US, while he is in a trip in Japan. Note: A similar product (with a few cool additions) is coming from snappy MULTIMEDIA and is called HAVA. Although the client seems a little bit lacking the product is still very impressing.